The Nissan Titan and Armada are not off-road vehicles. Not really. The Titan’s too damn big, and the Armada has 20-inch wheels and a freaking chrome vent on its front fender—clearly designed for stuntin’, as today’s teens say. 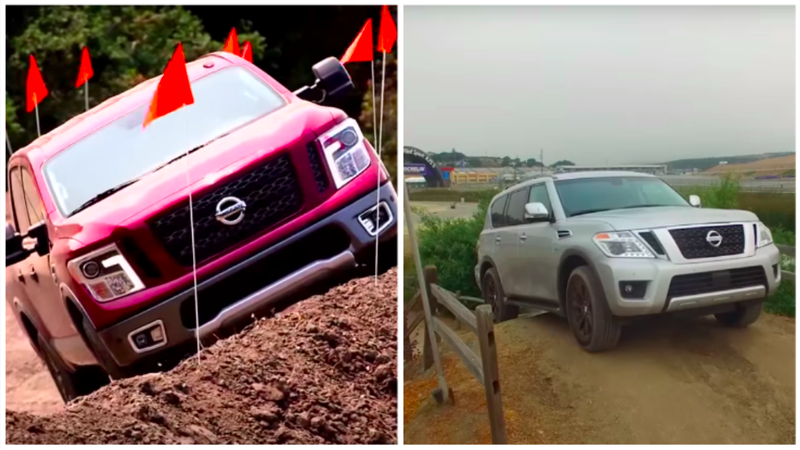 But if you’re curious what the two can actually do off-road, check out these videos. Let’s first look at some specs. The Nissan Titan has an independent front suspension and a leaf-sprung solid rear axle. That means decent travel out back, and very little up front, a fact that’s clearly visible in the video. The truck, in P4x trim, has between 9.8 and 10.6 inches of ground clearance, approach and departure angles of around 23 degrees, and a breakover angle of about 22—all acceptable figures for moderate off-road use, but definitely not enough to do any sort of challenging trail driving. But it’s a 19-foot long truck, so that shouldn’t be surprising. You can’t get locking front and rear differentials, you can’t get the trick sway bar disconnects for extra wheel articulation, and you are stuck with a suspension tune that caters to American on-road preferences. And you can’t get the Hydraulic Body Motion Control (HBMC) suspension system that links the four corners hydraulically, which reduces roll on-road and reduces harshness off. That’s on option on the Patrol, but it’s not in the cards for the Armada. Since off-roading over any sort of uneven terrain will clearly lift a tire off the ground, locking differentials would help, but the Armada doesn’t get that option like its overseas counterpart, instead making do with a limited slip differential, which—as seen in the clip—takes time to react to wheel spin before redirecting power. The 9.1 inches of ground clearance, 21 degree approach and breakover angles, and 22 degree departure angle are all okay numbers, but with those low-hanging running boards, the lack of flex, and no lockers, the new Armada looks like it should probably stick to the bunny slopes. But who knows, maybe Nissan will offer some more off-road hardware later? EDIT: Turns out the Armada’s big vents are actually functional. That’s cool.